Relevant to the unfolding chemical weapons saga, we bring to the attention this article by award winning author Manlio Dinucci first published by Global Research in October 2013. For years, Syria and Egypt refused to abandon their chemical weapons facing a threatening neighbor, Israel, which develops very sophisticated ones, in addition to biological and nuclear weapons. However, while Syria has joined the Organization for the Prohibition of Chemical Weapons , we are taking a look at Israeli activities. The UN inspectors who monitor chemical weapons in Syria would have much to do if they were sent to monitor the nuclear, biological and chemical weapons (NBC) of Israel. But according to the rules of “international law”, they cannot do so. Israel has not signed the Nuclear Non-Proliferation Treaty, nor the Convention Banning Biological Weapons , and has signed but not ratified the Convention Banning Chemical Weapons. The entrance of the Israel Institute for Biological Research, Ness- Ziona . This structure is the cover for the research and manufacturing of Israeli chemical and biological weapons. According to Jane’s Defense Weekly, Israel – the only nuclear power in the Middle East, has 100 to 300 nuclear warheads and their appropriate vectors ( ballistic and cruise missiles and fighter-bombers ). According to SIPRI estimates, Israel has produced 690-950 kg of plutonium, and continues to produce as much as necessary to make from 10 to 15 bombs of the Nagasaki type each year. It also produces tritium, a radioactive gas with which neutron warheads are made, which cause minor radioactive contamination but higher lethality. 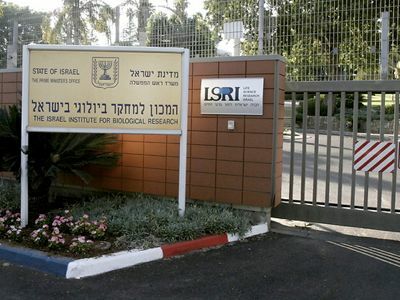 According to various international reports, also quoted by the Israeli newspaper Ha’aretz, biological and chemical weapons are developed at the Institute for Biological Research, located in Ness- Ziona, near Tel Aviv. Officially, 160 scientists and 170 technicians are part of the staff, who for five decades have performed research in biology, chemistry, biochemistry, biotechnology, pharmacology, physics and other scientific disciplines. The Institute, along with the Dimona nuclear center , is “one of the most secretive institutions in Israel” under direct jurisdiction of the Prime Minister. The greatest secrecy surrounds research on biological weapons, bacteria and viruses that spread among the enemy and can trigger epidemics. Among them, the bacteria of the bubonic plague (the ” Black Death ” of the Middle Ages ) and the Ebola virus, contagious and lethal, for which no therapy is available. With biotechnology, one can produce new types of pathogens which the target population is not able to resist, not having the specific vaccine. There is also strong evidence of research to develop biological weapons that can destroy the human immune system. Officially the Israeli Institute conducts research on vaccines against bacteria and viruses, such as anthrax funded by the Pentagon, but it is obvious that they can develop new pathogens for war use. The same expedient is used in the United States and in other countries to get around the conventions prohibiting biological and chemical weapons. In Israel the screed secret was partially torn by the inquiry that was conducted, with the help of scientists, by the Dutch journalist Karel Knip. It has also come out that toxic substances developed by the Institute have been used by the Mossad to assassinate Palestinian leaders. Medical evidence indicates that in Gaza and Lebanon, Israeli forces used weapons of a new design: they leave the body intact outside but, upon penetration, dévitalise tissues, carbonise liver and bones, and coagulate the blood. This is possible with nanotechnology, the science that casts microscopic structures by building them atom by atom. In this way, the Israel Institute for Biological Research could render pathogens even more resistant.